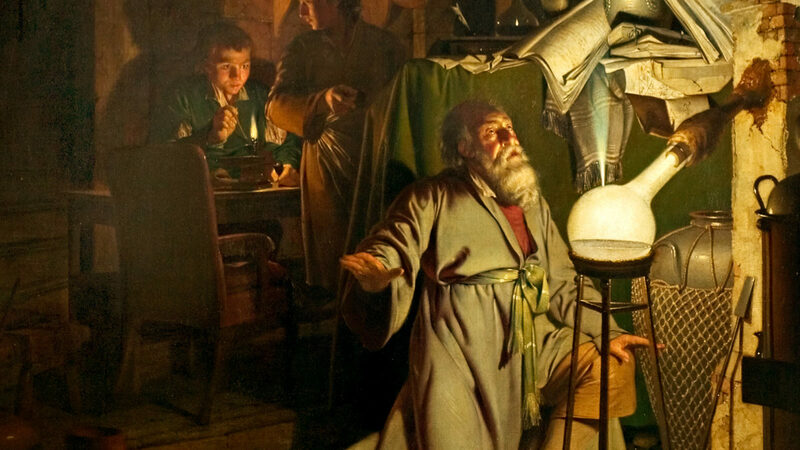 Featured above: The Alchemist Discovering Phosphorus, a 1771 painting by Joseph Wright of Derby that portrays Hennig Brand’s historical experiment. Take 2: Well, it finally happened: Technological disaster. You might notice that this episode is a little rough around the edges, and a little light on music. Basically, at the eleventh hour, my audio project got corrupted somehow, causing me to lose several hours of work. I had to redo the entire edit and frankly didn’t have the time to do as good a job as I did the first time around. My apologies for a somewhat less enjoyable listening experience. More Unhappy Endings: Brand may have made a monumental scientific discovery, but it still wasn’t really what he was looking for. He wanted gold, after all. Unfortunately, he never found it. After his discovery, he kept his formulation a secret, only selling it to other scientists when times got truly desperate. This actually led to other chemists, like Robert Boyle, receiving the credit for the discovery of phosphorus for many years until further documentation was uncovered, revealing where they learned the trick from. A Small Box Of Crayons: White and red phosphorus are different allotropes of element 15, like how coal and diamond are different allotropes of carbon. White phosphorus is the one that Hennig Brand discovered in urine, and it’s the most unstable. Red phosphorus is a little more well-behaved, and black phosphorus is an extremely stable allotrope. A mixture of black and red phosphorus is sometimes called “Violet Phosphorus,” but is not actually a unique allotrope. No Clever Subhead Here: Unlike chlorine gas, white phosphorus is a chemical weapon that still sees wartime use today, despite being at least as horrible. The United States admitted to the use of white phosphorus-based incendiary weapons in Fallujah in 2004, despite originally claiming (somewhat ludicrously) that white phosphorus was only used for “illumination.” The U.S. also used phosphorus-based incendiary weapons during Operation Desert Storm. The Israeli military used white phosphorus weapons against Palestinian civilians in Gaza in a “deliberate or reckless way” in 2009, and U.S.-led forces probably used those weapons in Syria at least as recently as 2017. Too Grim: In Episode 7, we mentioned the successors to chlorine gas: Nerve gas, weapons that were even more frightening. These are also phosphorus-based weapons, but they’re not firebombs. They interfere with ATP’s mechanism of action, leading to paralysis and eventually suffocation due to an inability to inhale oxygen. It is a horrific way to die. Sarin is one of these nerve agents, and in the early 1950s, the United Kingdom was running tests with the newly discovered substance at their labs in Porton Down. These tests often involved human subjects, including Ronald Maddison, a 20-year-old British soldier. The government told him that they were investigating cures for the common cold; what they actually did was pour a single drop of liquid sarin onto his skin. Tests at Porton Down involving the use of Sarin on British soldiers continued at least until the 1980s. I didn’t want to include this story in the main episode, but I do find it gripping and worth knowing about. More details can be found in this Guardian article or in various books, including Ulf Schmidt’s Secret Science: A Century Of Poison Warfare And Human Experiments. In Paradise Lost, John Milton’s 17th-century work of epic poetry, Lucifer is the name of the angel who leads a failed rebellion against God. He and his soldiers are cast into Hell, where he takes on his new name: Satan. Translated from Latin, Lucifer’s name means “light-bringer.” Today’s element, phosphorus, means the exact same thing in Greek. And, like the character from Paradise Lost, it’s a dangerous thing, is strongly associated with fire, and there’s more than a little phosphorus in all of us. Today, we’re distilling information on phosphorus. Ancient humans discovered several elementary substances in prehistoric times, like copper, gold, and carbon. But we don’t know who discovered those elements, and many of them probably have several discoverers from around the world. But there’s a very clear point in history where that changed: Chronologically, phosphorus is the first element we can point to and say, “We know who discovered that.” That person was a German named Hennig Brand, and the story of his discovery is not quite like any other on the periodic table. Brand was a German merchant from Hamburg who dabbled in alchemy. And while many alchemists studied observable natural phenomena, Brand was one of those alchemists who was purely in it for the money. He wanted to find the Philosopher’s Stone, a material that, theoretically, would be able to turn “base metals,” like lead and iron into gold. He appears to have been a literal kind of guy, because he reckoned that the way to synthesize a stone that created gold would be from a very common golden liquid: Urine. Specifically, human urine, preferably from those gents down at the biergarten who drink all that golden ale. There’s no account of who helped Brand, or how he convinced them, but somehow, he got his hands on around 5,000 liters of urine. And with it, he did… nothing. For several weeks, he let the urine go deliberately rancid in the hot sun, presumably giving him lots of time to reconsider his life choices. It’s an appropriate name: In addition to the “cold fire” Brand witnessed, it’s pretty connected to the hot kind, too: Phosphorus is extremely flammable. People began to take notice, in particular, a surprising historical figure whom we’ve met before: Annie Besant. London’s matchgirls led a work strike in 1888, helped by Besant’s advice and outspoken support. This was a time before electric lighting was available, so people were really dependent on candles and gas lighting, and this was the first time anyone had challenged the politically powerful match industry. There was enormous public support for the strike, and after only a week, the matchgirls had won fairer pay and safer working conditions. The bad publicity helped move the industry away from dangerous and volatile white phosphorus and toward the use of red phosphorus, which neither caused phossy jaw nor spontaneously ignited in contact with the air — safer both for manufacturer and user. For a hundred years, phosphorus was harvested from urine in pretty much the same way Brand had done it. But in the 1770s, Carl Wilhelm Scheele showed that there was an even richer biological source of element 15: Bone. Calcium gets all the press when it comes to bone health, but phosphorus is at least as important. As phosphate, or a phosphorus atom attached to four oxygen atoms, it accounts for over half of a bone’s mass. And while our skeletons are pretty important, there’s another role phosphorus plays in biology that’s even more important. Adenosine triphosphate, or ATP, is the currency of biochemical energy. Cracking apart a molecule of ATP provides a small amount of energy that a cell can use to perform essential functions. Every movement, from sprinting at full speed to batting an eyelash to a single heartbeat, requires the body to spend some amount of adenosine triphosphate. This means we go through a lot of ATP in any given day. Thankfully, our bodies are really good at recycling ATP — each molecule of the stuff can be used thousands of times over in a single day.6 That’s actually why we breathe: through respiration, our bodies use oxygen to glue ATP molecules back together, and we can use them again. We’ve name-checked guano a few times in past episodes, but we haven’t actually talked about what it is. I suppose it’s about time we remedy that. Indigenous people had been mining guano for centuries, but colonizing powers set off a global craze for the stuff. If you remember, agriculture was having a difficult time keeping up with booming populations, and farmers’ fields were being exhausted faster than they could be naturally replenished. Over a hundred islands were claimed this way, and several of them remain part of the United States, like Howland Island, Baker Island, Midway Atoll, and a handful of others. Nobody actually lives on most of these islands, as they’re far too small to support any kind of settlement. Kingman Reef is probably the saddest example among them: At low tide, it barely pokes out of the water as a narrow strip of land about three kilometers long and three meters wide.10 In fact, for legal purposes, these places don’t actually count as islands, but as merchant vessels on the high seas. Meanwhile, in the European Theater of the war, phosphorus had a much more direct effect. These munitions were laced with phosphorus and thermite, causing them to burn at over 1,400 degrees Fahrenheit for over a week. The city burned in a terrible firestorm, with plumes of flame rising twenty feet into the sky. Winds whipped at 120 miles per hour, toppling buildings to the ground and pulling trees into the air. And the target of Operation Gomorrah was one of Germany’s largest industrial centers, a shipyard and oil refinery, and a city that was home to well over a million civilians: Hamburg, the very city where Hennig Brand had discovered phosphorus. Clearly it shouldn’t be too hard to get your hands on element 15 for your collection: It’s in your food, and in your bones, and coursing through your veins — and other bodily fluids, of course. And that’s true! Though it used to be even easier. White phosphorus used to be in such supply that actors used to paint it on their faces for an eerie, otherworldy effect, like if they had to portray the ghost of Hamlet’s father. At least, until they realized that doing this might turn them into a ghost off-stage, as well. There’s at least one other prominent use of phosphorescent makeup in fiction, as well. Apologies for spoiling a century-old mystery, but this is the secret behind the very spooky and titular canine in the Sherlock Holmes story, The Hound of the Baskervilles. But red phosphorus is much easier to get a hold of in the 21st century. It comes with any old box of kitchen matches. But don’t be fooled by those little red match heads — the phosphorus is actually in the striker on the side of the box. Regardless of where you source your phosphorus from, just remember: no matter how brightly it gleams, it’s definitely not gold. Thanks for listening to The Episodic Table of Elements. Music is by Kai Engel. To learn , and a story that was just too grim to get into on this episode, visit episodic table dot com slash P. That is, the letter P, not the waste fluid. Next time, we’ll add some brimstone to this fire with sulfur. This is T. R. Appleton, reminding you that if it’s yellow, still, just flush it down. C’mon man. The Atlantic, What’s So ‘American’ About John Milton’s Lucifer? Edward Simon, March 16, 2017. Encyclopedia Britannica, Match. Last edited April 13, 2017. Spartacus Educational, The 1888 London Matchgirls Strike. RDH, The Return Of The Dreaded … ‘Phossy Jaw’. Lynne Slim, July 1, 2009. BBC Legacies, Setting The Workers Alight: The East End Match Girls’ Strike. Science Direct, Adenosine Triphosphate. Basic Neurochemistry (Eighth Edition), 2012. The National Museum Of American History, The Guano Islands Act Of 1856. Smithsonian Magazine, How The Gold Rush Led To Real Riches In Bird Poop. Jackson Landers, February 17, 2016. Atlas Obscura, When The Western World Ran On Guano. Cara Giaimo, October 14, 2015. It is home to a lone coconut seedling. At least, it was, about 15 years ago. Someone should go check on the poor thing. The Washington Post, The Guano Islands Act. Kevin Underhill, July 8, 2014. Encyclopedia Britannica, Battle of Midway. Last edited July 26, 2016. Stanford Computer Science, Firebombing In WWII: A Brief Introduction. Eric Roberts, British Technology And The Second World War.